Until a few years ago I could not stand avocados, I always thought they were a nasty wanna be cucumber in my salad. Adulthood must have changed my palette because now I love them! Whether, its guacamole in my burritos or in a salad. So when I came across this recipe I had to try it, and when I enjoyed my dinner I knew I had to share it. I'm hopping my readers will love it too. I usually have days where I eat no meat, to rest my digestive system, so this recipe is meatless, but you can definitely add grilled chicken if you like. Cut the avocados in half, remove seeds and spoon out the flesh andnblend together with the garlic, basil and the juice of the lime into a bowl. Now season with salt and pepper and puree. 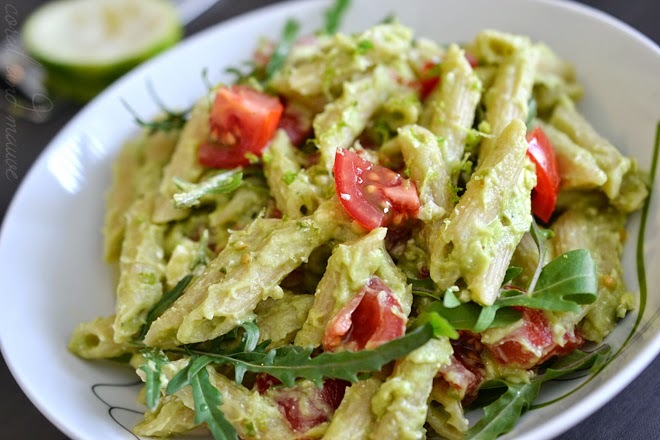 Cook pasta according to package directions, drain the water and stir in the avocado puree. At low heat until smooth and in the meantime cut the tomatoes into quarters, then stir into the pasta along with arugula, simmer for a minute and serve and enjoy! I'll be trying this tonight! !